Our Sun is a main sequence star. 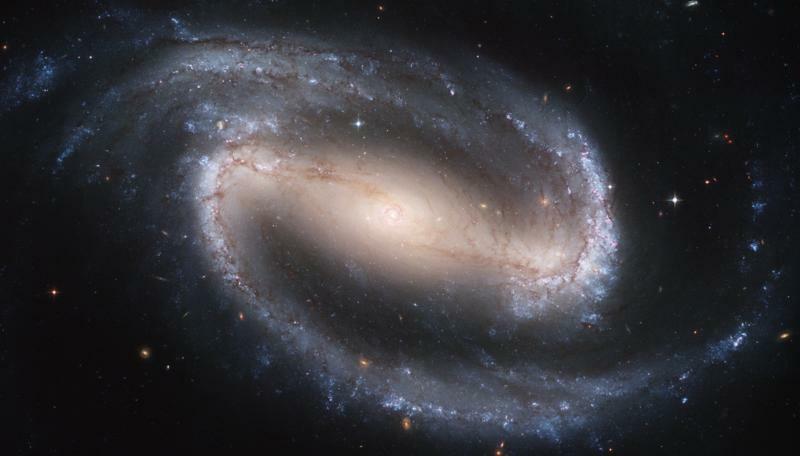 This is the evolutionary phase where stars spend most of their lives, burning hydrogen into helium in their cores. When this hydrogen is exhausted, they evolve to the next evolutionary phase, in which they fuse hydrogen in a shell outside the core. Meanwhile, the core contracts until helium burning temperature is reached in it. When helium runs out in the core, hydrogen and helium fusion continue in shells around a hot core of carbon and oxygen. Most stars will never reach temperature high enough to burn these two elements, ending their lives with this composition. The characteristics of these phases depend strongly on the initial mass and metallicity of the star. However, one thing is common to over 95% of them: they will eject their external layers on a planetary nebula and end their lives as white dwarf stars. The structure of a white dwarf is quite simple: a core usually composed of carbon and oxygen (which are the heaviest elements most stars can synthesize), a thin layer of helium, and a thin outer layer of hydrogen. Moreover, white dwarfs have a peculiar but well-defined mass-radius relation, due to the fact that matter is mostly degenerate in its core. All that makes them quite easy to model, allowing us to obtain physical parameters from observations, such as mass, temperature, and age, which are all correlated. Joining the facts that most stars become white dwarfs and that they are easy to model, one could get the idea to study our Galaxy solely by modeling the characteristics of the white dwarf population. That’s exactly what the authors of today’s paper did, as others have done before. The authors selected two well-determined white dwarf mass distributions, one limited by distance and the other by magnitude, and compared it to simulated distributions with ingredients reflecting our knowledge of our Galaxy’s formation, evolution, and current structure. The distance limited sample contains white dwarfs up to 20 pc, and it’s about 90 % complete, meaning we have detected about 9 out of every 10 white dwarfs in this region. That’s an advantage because there should be no strong selection bias. However, the sample has little over a hundred objects, so it’s statistically poor. To compare their simulations also with a larger sample, they also selected bright white dwarfs detected with the Sloan Digital Sky Survey (SDSS). The sample is much larger, over a thousand objects, but in this case suffers from selection bias from the survey criteria and sky coverage. 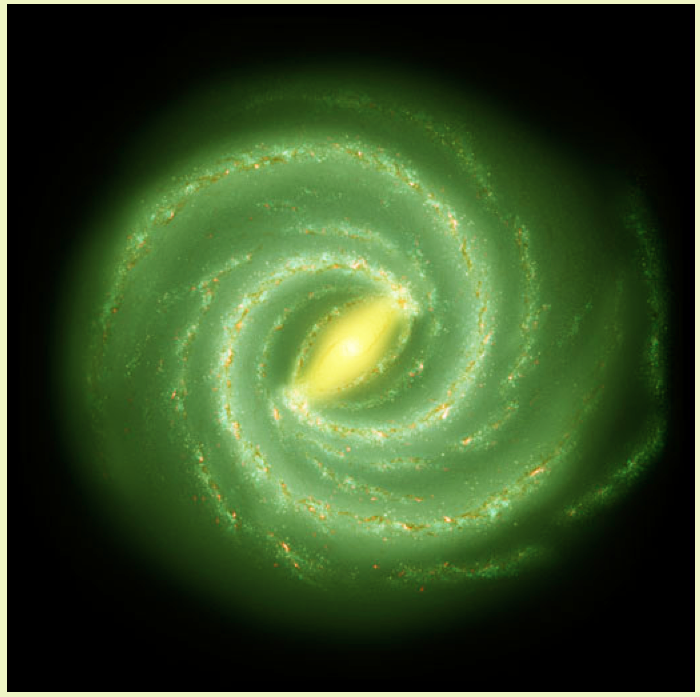 The main ingredients to their simulations are a star formation history (SFH), an initial mass function (IMF), an initial-to-final mass relation (IFMR), and a description to the vertical scale height of the Galactic disk. With only these four ingredients, one can cook up a nice mass distribution to compare with observations. The SFH describes how many stars were formed and when, the IMF defines the fraction of stars at each given mass interval when formation happens, and the IFMR determines the masses and ages of the resulting white dwarfs. The structure of the Galactic disk, determined by its scale height, will describe how the formed white dwarfs are distributed around us, allowing us to estimate how likely we are to detect them. The authors first simulated standard distributions with popular parameters from the literature: a constant SFH throughout 10 Gyr, which is the assumed age of the disk, a Salpeter IMF, a quadratic IFMR, and a variable scale height, increasing with the star’s age, i.e. allowing old stars to be further away from the plane of the disk than young stars. To compare with the 20 pc sample, they created stars in their simulation until they reached a significant number of detected stars within 20 pc. To compare with the SDSS sample, this was done until a fair number was reached in the SDSS covered region and within the upper and lower magnitude limits of the observational sample. They then built the mass distributions to their simulations and overplotted it, without any fit, over the observed distributions (Figs. 1 and 2). 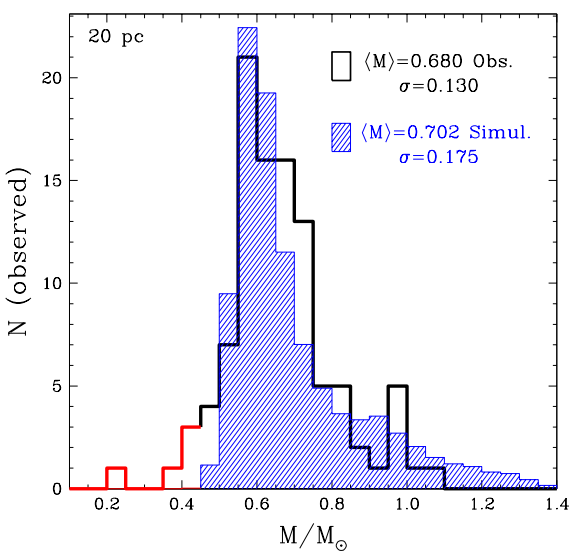 Figure 1: Comparison between the observed (black) and simulated (filled blue) mass distributions for the sample limited to 20 pc. Objects with masses below 0.45 solar masses (shown in red) are neglected for the computation of the mean mass and dispersion because they are the result of binary evolution, which is not taken into account on the simulations. The overall shape of the distributions, and the mean mass and dispersion labeled on the panel agree remarkably well, considering no fit was done. 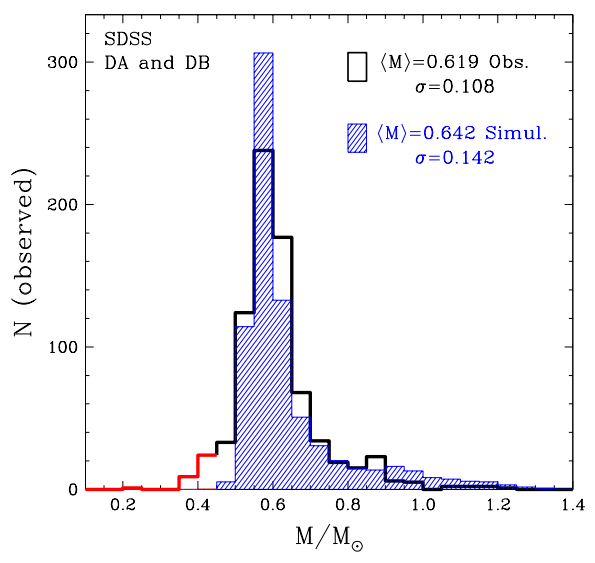 Figure 2: Observed (black) and simulated (filled blue) mass distributions for the white dwarfs in the SDSS sample. They are of types DA (hydrogen-dominated atmosphere) and DB (helium-dominated atmosphere). Binaries and magnetic white dwarfs were removed from the sample. Low-mass objects were neglected as mentioned on Fig. 1. A similar shape and agreeing mean mass and dispersion are obtained between simulation and observation, even without a fit. The result is quite impressive: the overall shape, mean mass, and dispersion of their simulations agree remarkably well with the observations. This reflects the fact that, given the uncertainties in our observations, our models are good enough to describe then. However, not all is perfect: they notice that their simulations predicted a higher fraction of higher mass white dwarfs than the observations by a factor of about 1.5, making their simulated mean mass higher than the observed in both cases. The authors then went one step further: they tweaked their ingredients to see how that would affect the obtained distribution, and whether it could result on a better agreement with the observations. Their main result is that a steeper IMF function could bring the fraction of higher mass stars closer to observed values. This would mean that the ever so popular Salpeter IMF may need a revision. The authors caution that, given the current uncertainties, we cannot rule out that the Salpeter function is correct and that what actually needs to improve is the IFMR. Changes to the SFH and to the description of the disk scale height cause less prominent effects. The roles of each of these ingredients and their influence on the white dwarf mass distribution should become much clearer in the near future when Gaia will have obtained parallax measurements to most of these white dwarfs, allowing us to much better constrain their physical parameters, as the authors point out. The authors give us an idea of where should we put our attention in the meantime with regards to modeling: mostly the IMF, closely followed by the IFMR. We have only a few more years to work on our models and improve our descriptions to try to explain what Gaia will reveal us. Better get to work!